• Converting the existing rail freight corridor into a multimodal corridor which offers a new type of transit, available in only a few cities across the country, that brings people to their jobs or to weekend entertainment downtown, without displacing rail freight that supports local businesses. • A new way of engaging with the Allegheny River, where future development works with the landscape to restore a healthier river and ecosystem. • A neighborhood where residents and employees can step outside their doors onto a multi-use trail system, kayak and boat access, or onto transit that will take them downtown. a six-mile stretch of the Allegheny Riverfront is experiencing revitalization, but areas are still in transition, ready for the next steps in decision-making. The Green Boulevard Plan will determine Allegheny riverfront park access, open space programming, neighborhood design, and the types of transportation modes that will be options for Pittsburghers for many decades to come. The plan also also explores connecting Highland Park to Downtown with a bike-pedestrian path, expanding public space on the Allegheny River, and creating new neighborhood development in Lawrenceville. 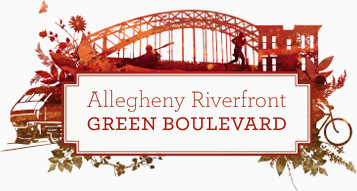 The final public meeting for the Allegheny Riverfront Green Boulevard planning process will take place this Thursday, November 15, from 6:00 – 8:00 p.m. at the Teamster Temple at 4701 Butler Street in Lawrenceville. For more information, check out the Green Boulevard website, or on Facebook. It is the beginning of the holiday season. What better way to celebrate than with light displays? Yesterday, Staffski posted about the opening of the Hartwood Acres season celebration. Tonight, Downtown Pittsburgh will be all aglow with their own Light Up night. This year marks Light Up Night’s 50th Anniversary, with events planned for today and tomorrow. 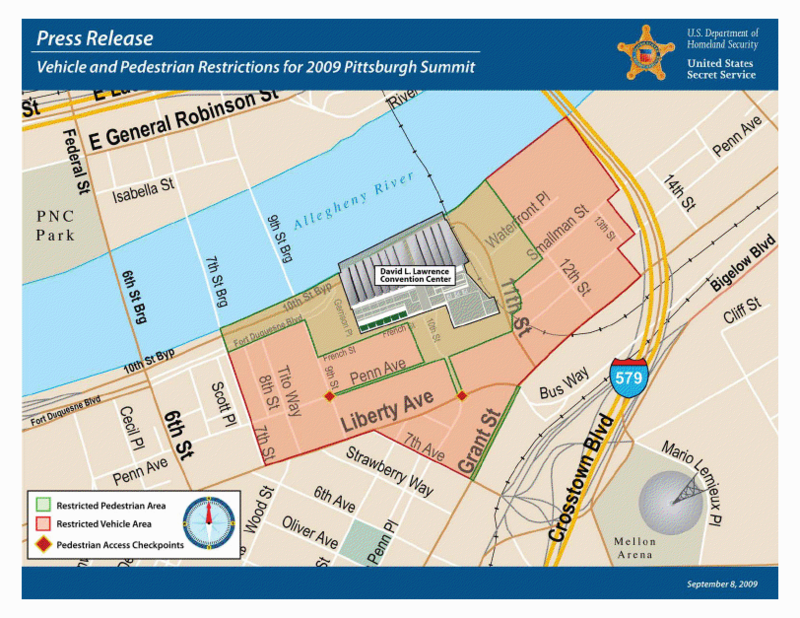 A full event schedule and map are available on the Pittsburgh Downtown Partnership site. Also available on the site is a list of road closures and detours. Also, we hear from our friends at PAT that most bus service will operate on special detours and likely experience delays Friday and Saturday during the annual Light Up Night celebration. A detailed list of route and stop changes is available online at www.portauthority.org, although due to the nature of the festivities, buses might experience unscheduled detours and delays. 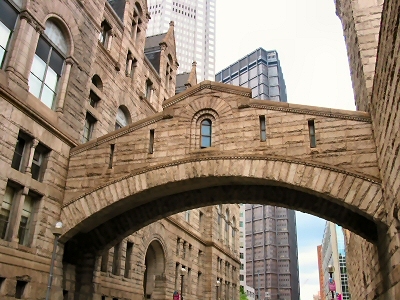 Here’s your chance to walk across the Bridge of Sighs–without going to jail–and to explore and learn about the architectural significance of two of Pittsburgh’s most famous downtown landmarks. Register for the Pittsburgh History & Landmarks Foundation’s walking tour on Saturday, March 20, from 1:00 to 5:00 p.m. The tour will explore the Allegheny County Courthouse and former Jail (H. H. Richardson, 1884-88) and the City-County Building (designed by Henry Hornbostel, 1915-17). Visitors will also hear about the green roof planned for the County Office Building Annex. Fee: $10 for PHLF Members (or students). $20 for non-members. Email your tour reservation to marylu@phlf.org. Space is limited. For a complete schedule of special events in 2010, visit the Pittsburgh History and Landmarks website (click on “Tours & Events”). The winter 2009/10 skating season will start when North Park and South Park ice rinks open on Thurs., Nov. 5 (weather and conditions permitting). The skating season will run through March 14, 2010, and the Parks Department will once again offer both free and paid skating lessons throughout the season to residents ages five and older. For additional information, please call the North Park Ice Rink at 724-935-1280 or the South Park Ice Rink at 412-833-1499. As to skating rinks closer to our neigbhborhood, there’s no word yet on when the Schenley Skating Rink will open. The PPG Skating Rink in Market Square will open on Nov. 20. Light Up Night is Nov. 21. 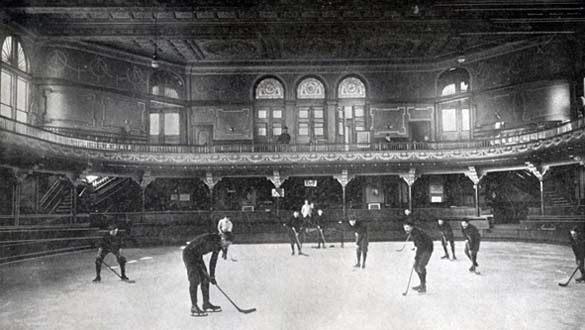 The above photo was taken in 1895 and shows Pittsburgh’s first hockey team playing in the Schenley Casino, the city’s first indoor skating rink. If you’d like to know more about the Schenley Casino, click here. Wednesday, September 23, 2009. Scheduled speakers are Leo Gerard, International President, United Steel Workers; Carl Pope, Executive Director, Sierra Club; Richard Trumka, President, AFL-CIO; and Maggie Fox, CEO and President, Alliance for Climate Protection. Scheduled entertainers are Da Flow Band, the Pittsburgh Gospel Choir, Joan Jett and the Blackhearts, Big Head Todd and the Monsters, Kathy Mattea, Joe Grushecky & The Houserockers. The event co-sponsors are Senator Ferlo, United Steel Workers, Alliance for Climate Protection, Blue Green Alliance, AFL-CIO. The event is wheel chair accessible, free, and open to the public. Reserved seating tickets are available on a limited basis. 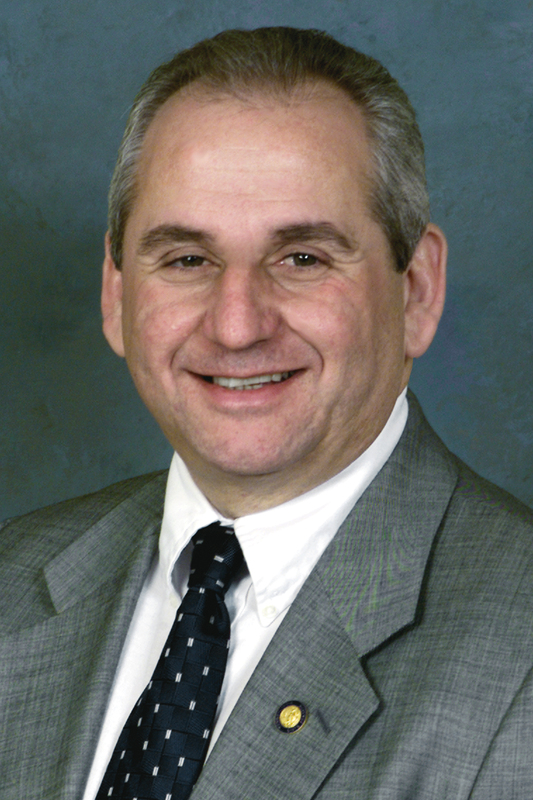 For ticket information, email Mikhail at mpappas@pasenate.com, or call 412.621.3006. Allegheny County Executive Dan Onorato today announced the County will host International Food Week in the Courthouse Courtyard from 11:30 a.m. to 1:00 p.m., Monday through Friday next week. Each day will feature lunch specials priced from $5 to $7. 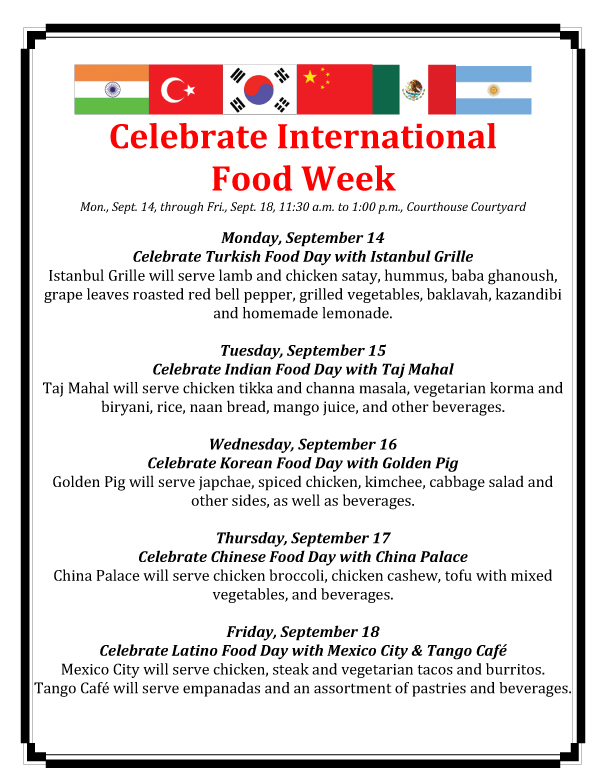 International Food Week will feature lunch specials, desserts, drinks and music from Turkey, India, Korea, China, Mexico and Argentina. Local restaurants will provide and serve the lunches. We still don’t know anything about traffic restrictions or how bus service will be affected, but here’s one more little bit of information about the upcoming G-20 Summit: the Secret Service has released summit perimeter information. We knew that the area around the convention center would be closed; here are the details. Beginning at 8 p.m. on Wednesday, Sept. 23, and ending at 8 p.m. on Friday, Sept. 25, vehicular traffic will be prohibited around the David L. Lawrence Convention Center from Liberty Avenue and Seventh Street north to the Allegheny River and east to about 13th Street. Traffic will be also restricted along Grant Street south to Seventh Avenue. A smaller perimeter within that zone will be restricted to only summit delegates, staff and journalists who have received credentials in advance from the White House. Checkpoints to enter that zone will be placed at Liberty Avenue and Tenth Street, and Penn Avenue and Ninth Street. For additional details, read the item from the Pittsburgh G-20 Partnership website. For summit-related transportation updates, the City has set up a website where you can sign up for automatic e-mail alerts. Next week the City will finally issue their traffic plan for G-20. The garden area is currently being excavated to create a depression where native vegetation will be planted. Runoff from nearby parking lots, adjacent roadways and other impervious surfaces will flow into the depression and be filtered through layers of sand, stone and soil, thereby removing silt, chemicals and pollutants that would otherwise reach the lake and creek. The garden will also help to control erosion of stream banks and the lake shore. In addition, the garden will serve as an educational tool for people of all ages. An informational sign placed at the garden will teach visitors about the benefits of rain gardens, and presentations at the site will encourage residents to mitigate their impacts on the environment. Allegheny County is currently in the process of converting the planters in the Courthouse Courtyard into rain gardens and developing a green roof on the County Office Building – the first green roof on a public building in the County. and cooling costs. It will also absorb rainwater that would normally drain into storm sewers, thus reducing runoff and pollution. The green roof will reduce air and noise pollution, decrease the “urban heat island” effect, lessen flooding events and sewer overflows, provide urban habitat for birds and butterflies, and increase roof life at least two to three times. In Southwestern Pennsylvania, an average rain storm can produce two inches of rain in a 24-hour period. Even two inches of rain falling on a roof can result in more than 600 gallons of water rushing through downspouts and into sewer systems. As little as 1/10 inch of rain can cause combined sewers to overflow. As rain travels over hard surfaces, it picks up and carries pollutants, such as oils, silt, chemicals and debris. The large amount of impervious surfaces in urban areas does not allow rainwater to permeate into the soil. Instead, rainwater flows into storm and sanitary sewers, as well as local streams, which are often unable to handle the higher water volumes, causing back up and eventual flooding. For information about rain gardens, visit 3 Rivers Wet Weather and the Three Rivers Rain Garden Alliance.